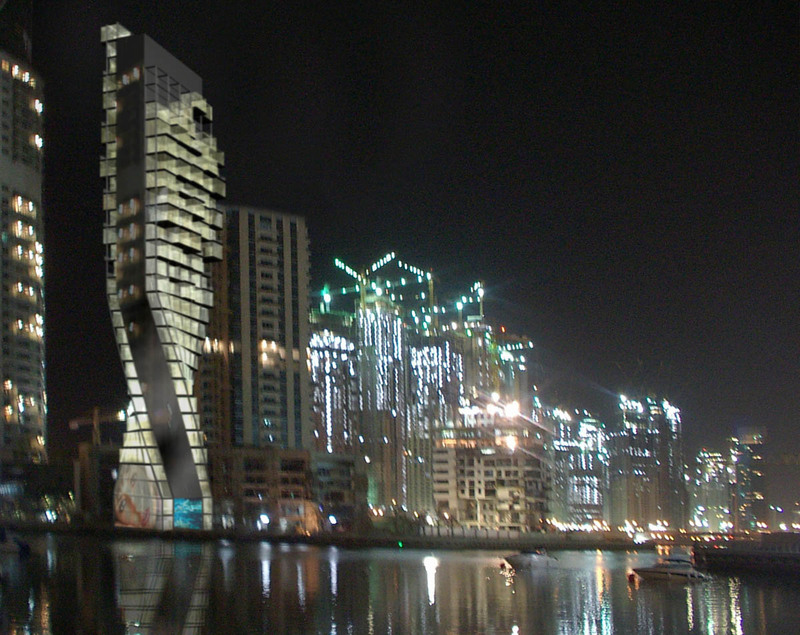 The tower benefits from a strategic situation on the Dubai waterfront, and from an open view on both the lagoon and the bay in Dubai. 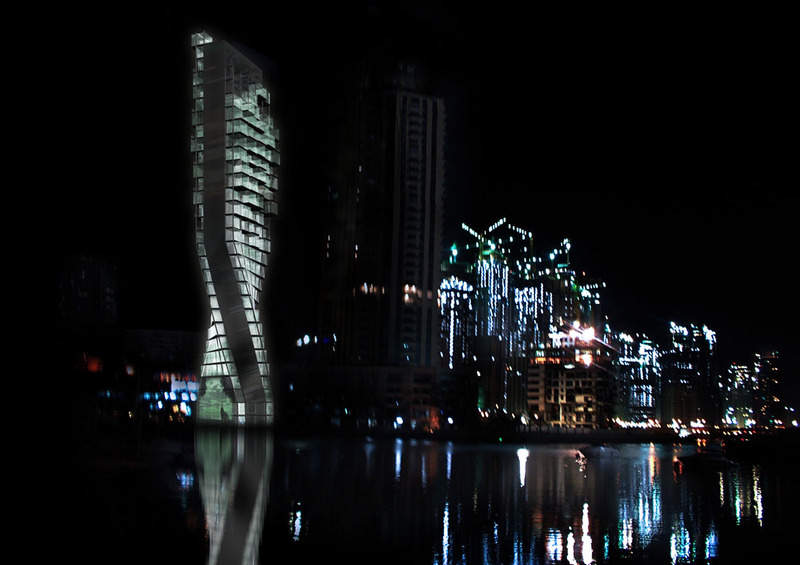 This building distinguishes itself by its light structure, consisting in two large reticulated blade-like structures, spaced ten meters apart from each other, which are twisted by a 45 degrees angle away from their bases. This rotation allows us to accentuate the slenderness impression and to set the views from the apartments towards the best sceneries – Palm's lagoon and Dubai's bay. At ground level, the gently sloping headland opens the view and offers visible access, from either side of the building, through two enormous aquariums, forming the bases of reticulated blades. Furthermore, the slope allows the introduction of a two levels parking space. The empty space between the two blades partially forms an atrium, containing the vertical (elevators and staircases) and the horizontal (corridors and footbridges) forms of circulation. The glass apartment blocks are inserted in the free spaces within the structural elements (steel columns and beams). Each block has a variable depth more or less outward on the front wall. Furthermore, a gradual chromatic progression is applied to these blocks, by means of some small coloured dabs, from the darkest to the most transparent one. This "pixelisation" of the front wall leads to the disappearing of the limit between the tower and the sky. The result of all of this is a subtle play on shadows and colours, which endows the front wall with three dimensional undulation, thus giving the impression of a vertical Medina. The act of individualising the blocks allows us to make each apartment unique and to view them as small houses, which form the Vertical Village reminding us about the historic neighbourhood of Dubai.